Posted on 08/03/2017 at 9:53 am. RAMALLAH, March 7, 2017 (WAFA) – Recognition of Palestine is on the agenda of the Dutch government, Andre Haspels, director general of political affairs at the Dutch foreign ministry, said on Tuesday. Haspels, who held talks with Palestinian officials in Ramallah, stressed the importance of cooperation between Holland and Palestine in all fields, particularly in the academic sector. He said he was in Palestine to study the situation and needs of the Palestinian people. 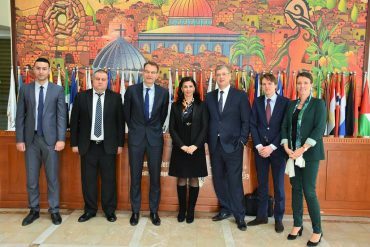 Amal Jadou, assistant minister and head of the European department at the foreign ministry, briefed the Dutch officials on the latest political and economic developments in the occupied Palestinian territories. She said the economic situation is very difficult in the absence of a clear political horizon at this time.